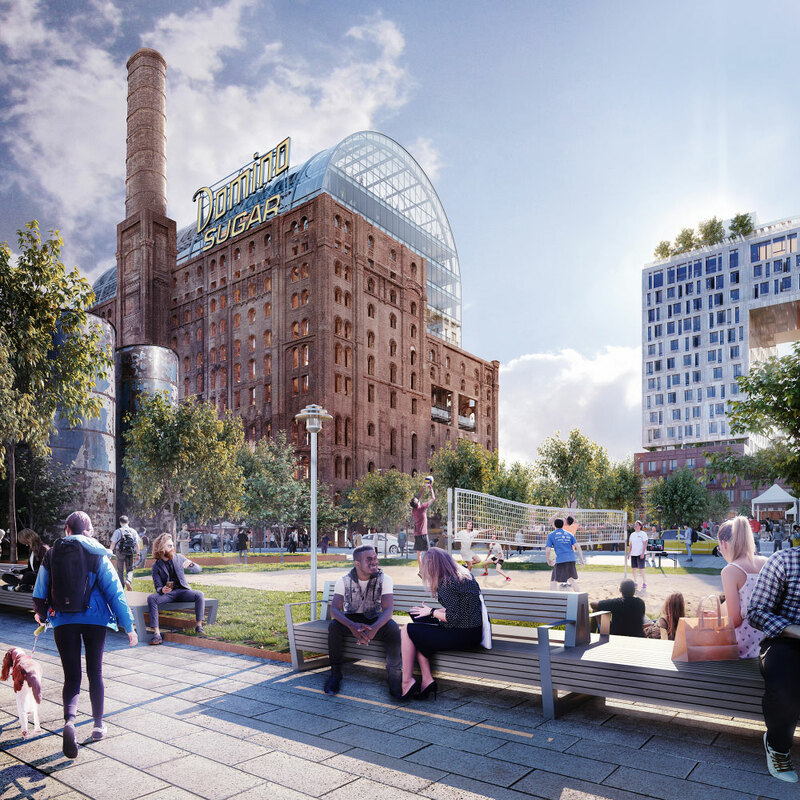 Ahead of its June 2018 opening date, Domino Sugar Factory developer Two Trees Management has released new renderings of the project’s forthcoming park, as well as opened the site up for a tour. 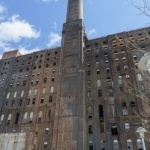 AN had a chance to check out the James Corner Field Operations-designed Domino Park, as well as the completed 325 Kent Avenue and the ongoing interior demolition at the Domino Sugar Refinery. 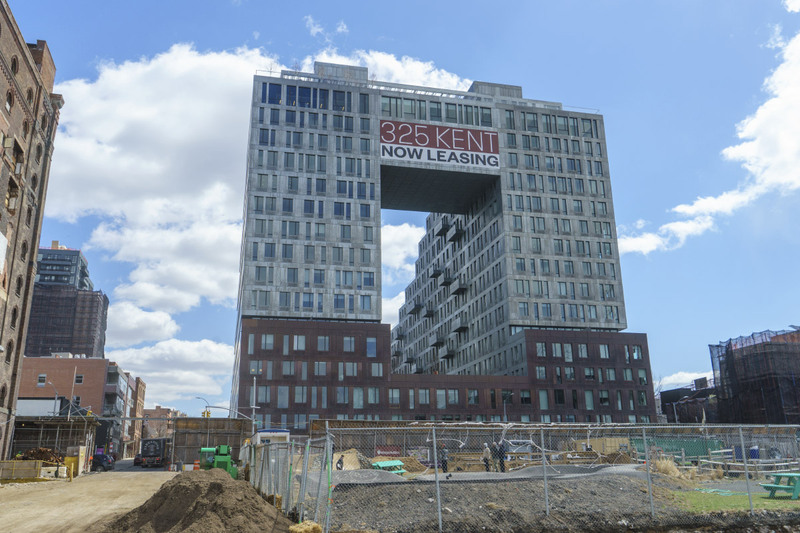 The SHoP Architects-designed 325 Kent, a doughnut-shaped rental building set back from the Williamsburg waterfront, was the first building to reach completion at the SHoP-master planned site. 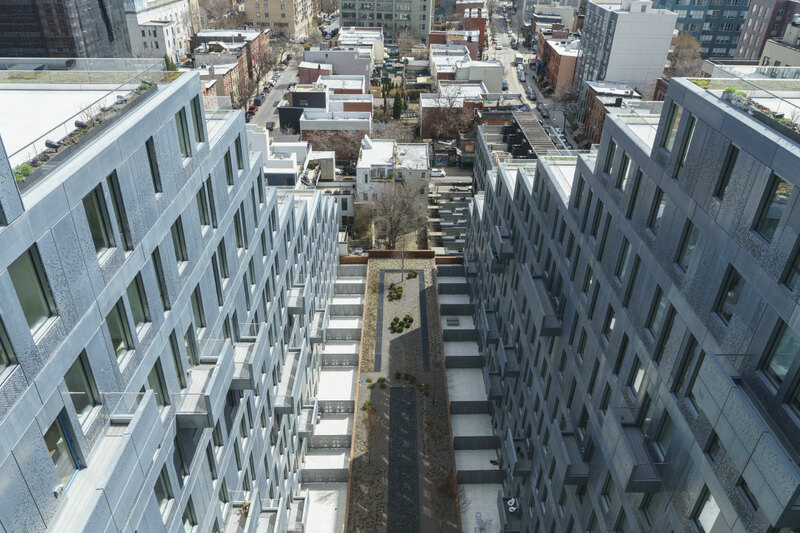 The 16-story, 500-unit rental building (105 of them affordable) began welcoming residents back in September of 2017. 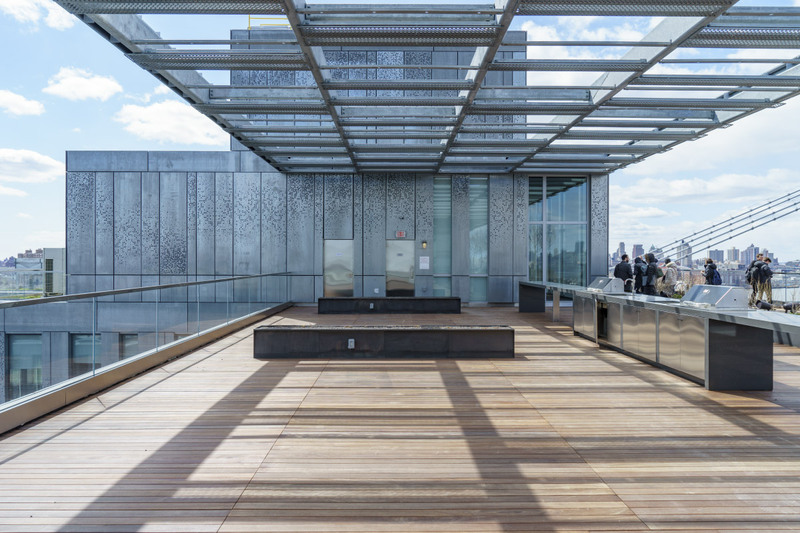 As the weather warms up, residents will get to make use of the rooftop amenities on display, such as curved concrete furniture, lounge chairs, and the central strip of courtyard that runs between the building’s central arch. 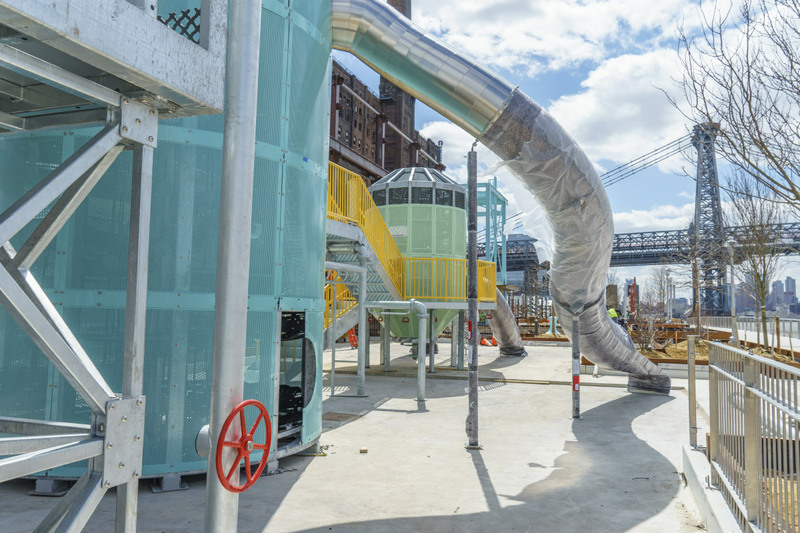 Domino Park is taking shape at the foot of 325 Kent and is on track to open in only 8 weeks. 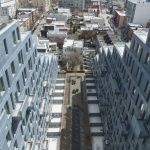 The quarter-mile-long park breaks its programming into “active” and “passive” activity spaces, with the more active areas located closer to the thrum of the Williamsburg Bridge. 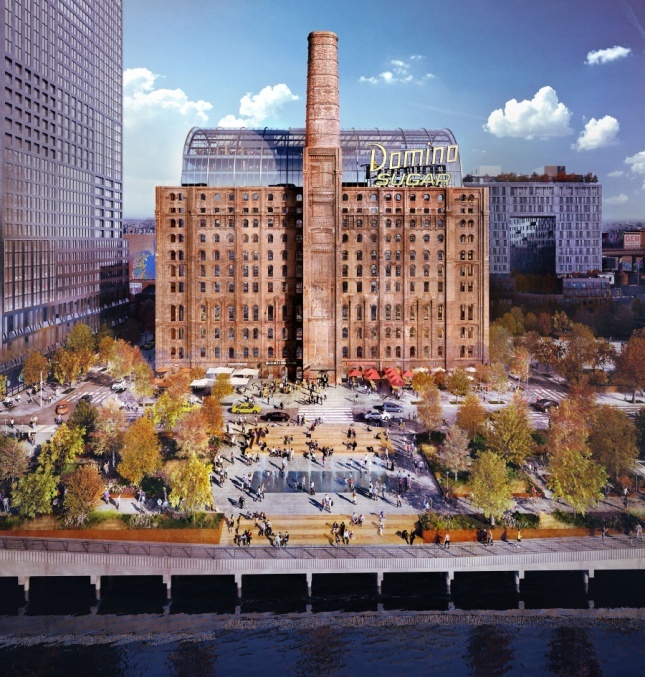 The second Domino Sugar Factory tower, the mixed-use, COOKFOX-designed 260 Kent, is on track to open in 2019. 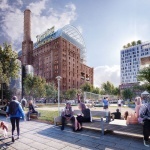 A dog run, two bocce ball courts, a 6,300-square-foot “flexible playing field” and a volleyball court make up the more energetic half. 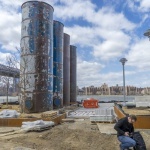 At the other end, a Japanese Pine garden, 80-to-100 person picnic area, and the Danny Meyer-run taqueria, Tacocina, will sit at the quieter half of the park. 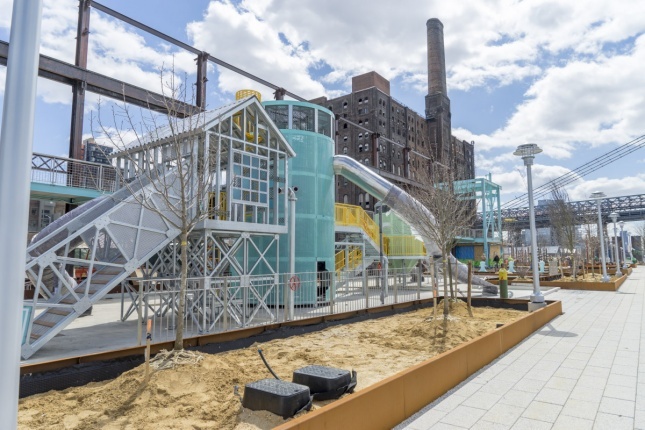 A technicolored children’s play space designed by artist Mark Reigelman, with industrial pieces inspired by the sugar refining process, can be found at the passive end of the park, as can 585-linear-feet of elevated walkway. 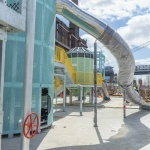 The walkway sits directly on top of Tacocina, and incorporates 21 steel columns from the former Raw Sugar Warehouse into its superstructure; the sight will be a familiar one to visitors familiar with Kara Walker’s The Sugar Sphinx. 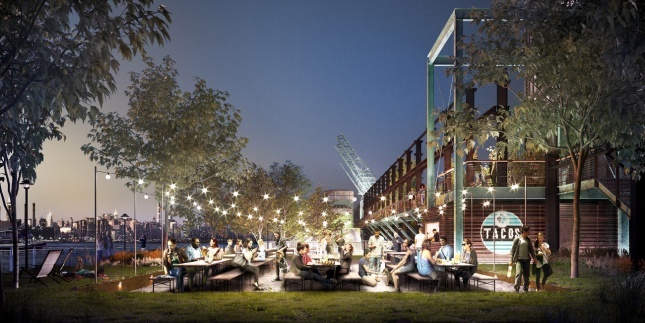 Linking each area along the waterfront will be the Artifact Walk, a five-block-long stretch that proudly displays historical refining artifacts salvaged from the site. 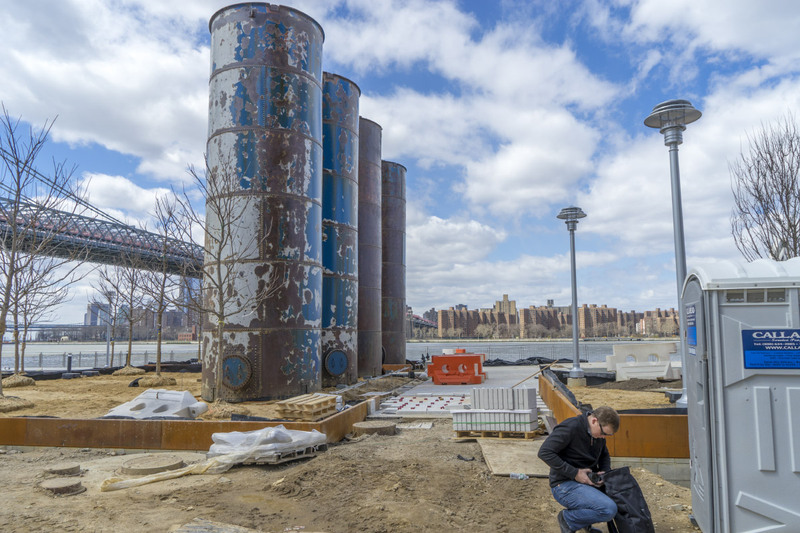 Four 36-foot tall cylindrical syrup tanks embedded in the Syrup Tank Garden, mooring bollards, signage, and corkscrews have been installed across an elevated platform on the water’s edge. 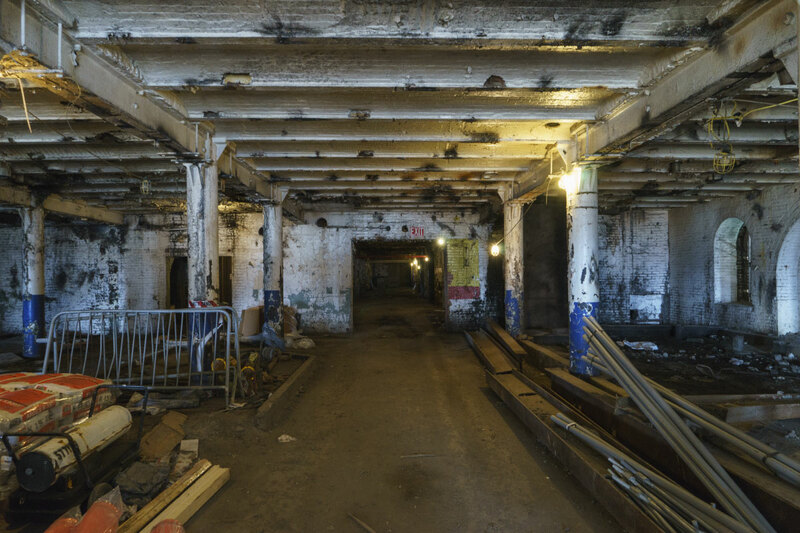 Damaged during Hurricane Sandy, the existing platform was raised to a uniform height above the river, and the new piles have been encased in concrete. 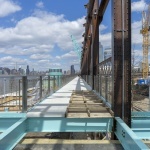 To build a historical link to the pre-existing structure, a hole has been cut in the platform and visitors can view the existing wood posts and river below. 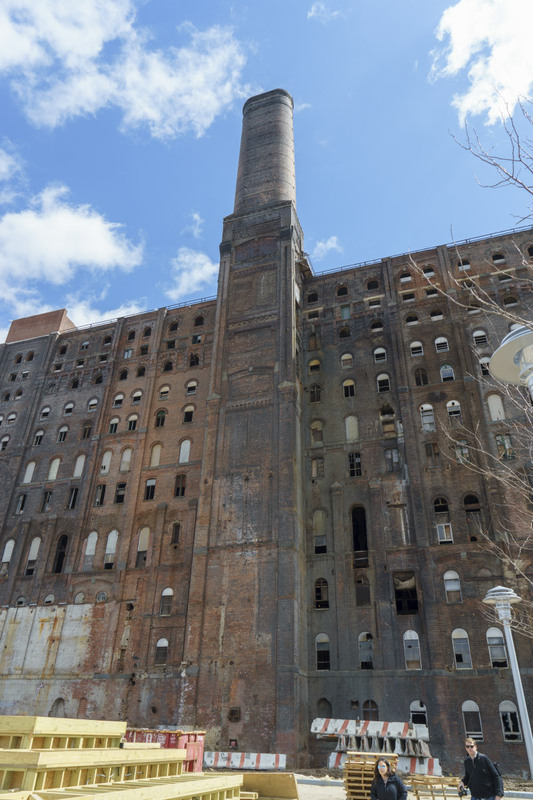 Work on gutting the Domino Sugar Refinery is still ongoing, in anticipation of the PAU-designed glassy office space that will soon sit within. While the exterior of the factory has been landmarked, preserving the interiors would have been impossible due to the interconnected nature of the refining machinery. 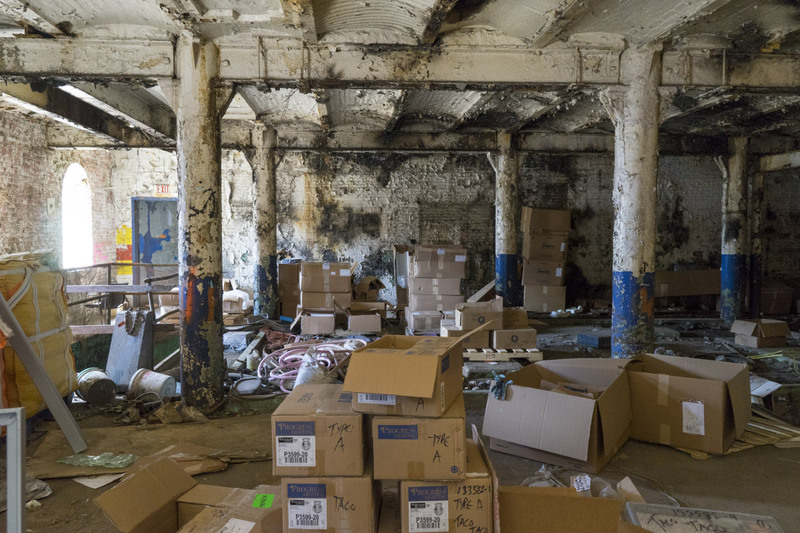 Even though the factory shut down in 2004, the thick smell of molasses is still hanging around the building at the time of writing. As for the park, although it’s technically private, Two Trees has opened the expanse to the public and is working closely with the New York City Parks Department. 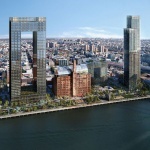 A representative from the development company has stated that James Corner Field had their designs reviewed and approved by Parks, that the stretch will operate on normal NYC park hours (dawn to dusk), and that they’ve given the city permission to claim the park if maintenance falls behind. 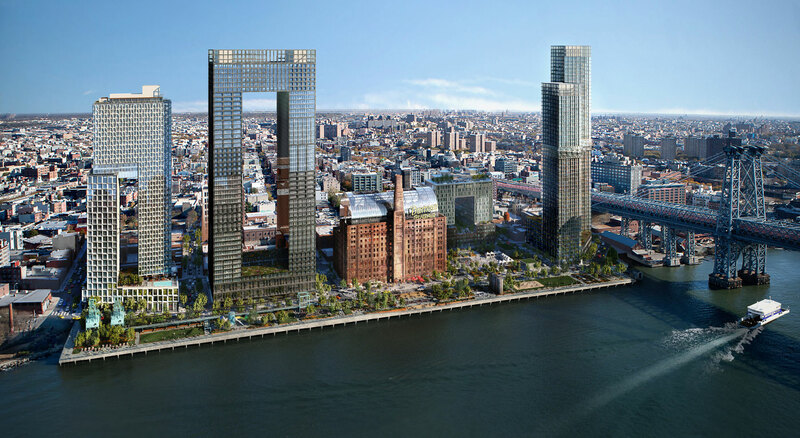 AN will provide a final look at the finished Domino Sugar Park once the project is completed this summer. 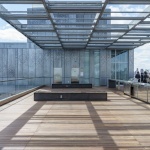 COOKFOX’s 260 Kent will be featured in detail at the upcoming Facades+ workshop “K. 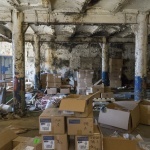 Domino Site A: Big Area Additive Manufacturing (BAAM) & When and Why to Use It” on April 20.